Baby sage 'Hot Lips' (Salvia microphylla 'Hot Lips'): growing, planting, caring. A cultivar with bicoloured flowers - white with... red lips. 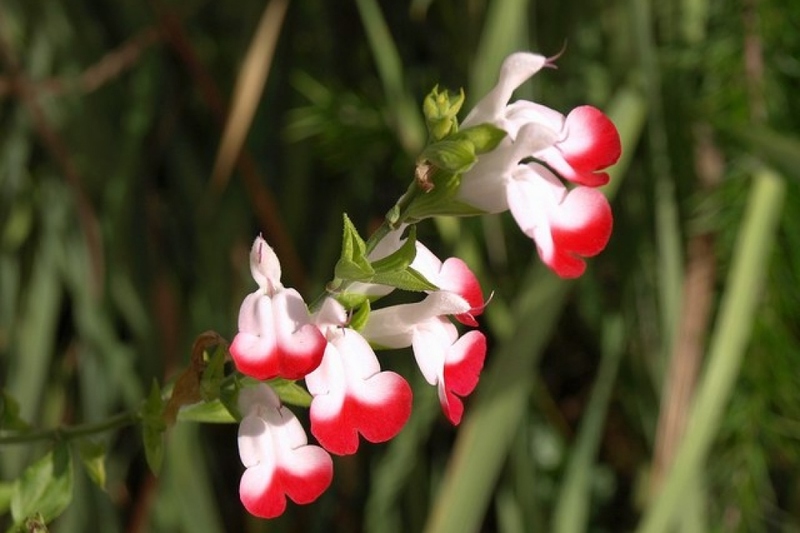 'Hot Lips' is a bushy cultivar of sage, with an evergreen foliage if not cut back by frost, consisting of small, ovate, aromatic green leaves. Flowers are borne in loose terminal racemes, red in midsummer, then bicolored red and white in July and August - and until the first frosts. This cultivar belongs to the species Salvia microphylla, which is a plant species of the lamiaceae family. The best way to differentiate this cultivar from other Salvia microphylla is by its striking two-toned white and red flowers. This semi-shrubby plant has a low bushy habit and persistent, oval leaves. These are small and opposite, decussate, oval or elliptical, with rounded teeth. The stems are brown. Flowering occurs from June to October, in clusters of whorls of many small flowers (2 to 2.5 cm). The entire plant measures 1 m to 1.3 m in the adult state. Plant small leafed sage in ordinary soil - even poor or rather chalky - as long as it is well-drained. This plant tolerates some drought. It doesn't like heavy or soaked soils which can hinder its hardiness in winter. Plant it exposed to the sun or in semi shade. Prepare the soil with some light digging (to decompact without necessarily turning it over with a pitchfork or broadfork), hoeing, and raking. Plant leaving 1 m between the plants. Tamp the soil down well so that the roots are not in contact with air, then water generously. If potted, plant in a fibrous compost or light soil, providing a container with a diameter of at least 40 cm. Place the pot in a lighted area. Always thoroughly water adult plant even if that means doing it less often; the plant will develop a better root system if it must look for water deep underground. "Thoroughly" means that the water you pour is no longer absorbed by the soil and forms a little puddle. Unless otherwise stated, never wet the foliage: plants "drink" with their roots. The seedlings need to be watered with a light shower so as to not turn over everything. Keep them constantly moist to encourage germination. In the spring, cut the very external stems and the ends of the branches that flowered the previous year. With a respectful approach to soil life, it's always better to fertilize a little in advance with organic material that will decompose; spread out a compost that isn't entirely decomposed, with well decomposed manure at the plant's base, and incorporate over 10 cm with a hoe. This operation is normally carried out in winter so that earthworms and bacteria have time to do their job. Propagate in May-June. The method of herbaceous cutting is a little complicated. It is simpler to proceed with a root cutting. This also enables to preserve the sage's vitality. The root cutting propagating method consists of dividing each root stump into several parts with each containing: - roots - at least one leaved stem - a clump of dirt stuck to the roots. Then, plant each stump in a pot full of potting soil, and put the mother plant back in the ground. Water the stumps regularly the first two weeks. After several months, you can plant the new plants in the ground. Mulching the perennial plants will save you from watering and weeding and will even fertilize the soil a bit as it decomposes. When choosing, know that dry wood chips are the most inert, but they will last for a longer time. Fresh wood chips and leaves enrich the soil but must be changed often. Grass cuttings are to be used mixed with something else in a layer that is at most 1 cm thick. Mulch with a thickness of at least 5 cm to provide a good level of efficiency.